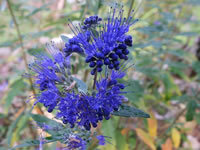 Bluebeard plants are also commonly known as the Blue Mist shrub or Blue Spirea. They are low growing, 2-3 foot shrubs that are covered with fragrant, powder blue flowers in late summer and early fall. The silvery green, 1"-2" leaves have a light aroma of Eucalyptus when rubbed. Bluebeard flowers are a favorite food for butterflies and bees. Bluebeards are hardy in USDA zones5-9. They should be planted in moderately rich, well draining soil. Grow your Bluebeard plant in full sun or very light shade. Water regularly and thoroughly until the plant is well established, then water moderately. 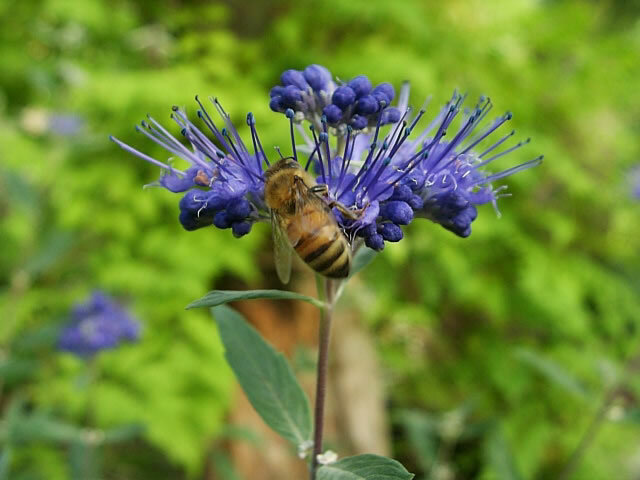 Blue Mist shrubs can be cut back to within a couple inches of the ground in winter or very early in the spring to encourage dense, tightly branched new growth. If needed, additional light pruning can be done in late spring or early summer for shape. Bluebeards bloom on new growth, so pruning does not affect flowering. Established plants can be divided in early spring or in the fall.